Sweet potatoes are high in Vitamin A - an antioxidant that is especially great for your eyes, skin, and immune system! Try this recipe over rice for a perfect dinner meal! Heat 1 Tbs oil over medium heat in a deep skillet. Add potatoes and cook, stirring occasionally, about 5 min. Add another 1 Tbs oil, along with onion, bell pepper, and garlic to the skillet with the sweet potatoes. Cook about 5 minutes, stirring occasionally, until the onion is soft and the sweet potatoes are tender. Divide the hash between 4 plates and return skillet to the stove. Heat 1 tsp oil in the skillet over medium heat. One at a time, add each egg to the skillet. Cook about 1-2 minutes, until the whites are nearly solid (no longer clear). Flip the egg and cook for one more minute. 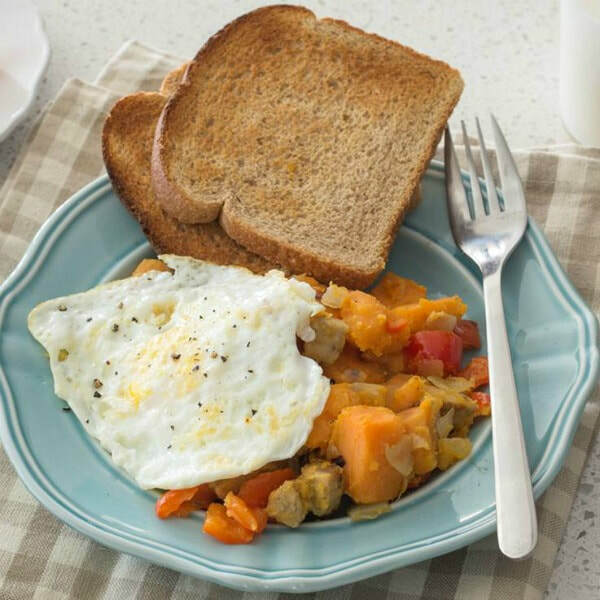 Top sweet potato hash with an egg, and serve right away.